Cheap As Bricks - quality recycled and used vogue grade bricks, builders grade bricks, paving grade bricks, feature wall grade bricks and face grade bricks all at unbeatable prices. Paving Grade - This grade of recycled brick are our most popular, coming in a large variety of blends and colours. They are the first choice of recycled bricks with landscapers. This type of recycled brick are found in driveways, garden edging, walk ways and are striking to look at when the job is finished. Paving grade bricks are in high demand so it's not unusual for our brick depot to keep substantial amounts in stock. 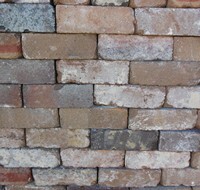 Recycled Feature Bricks - These type of recycled bricks are becoming more and more popular. They are rustic in appearance, with colours ranging from chocolate browns, rusty reds and different variations of grey's. it's not unusual for us to supply large quantities for entire homes to be built out of this recycled brick.